I CRIED TEARS OF HEARTBREAK BUT ALSO JOY. This sequel to Bardugo's dark YA fantasy duology was by turns thrilling, funny, romantic, clever, heart wrenching, healing, dark, and ultimately unputdownable. I loved all the characters so much, I loved the setting and the world building, I loved how dark and complicated but also hopeful the way the book looked at the lives of these older teens was. One of those books that reminded me of how joyful but also painful reading a truly great book is. 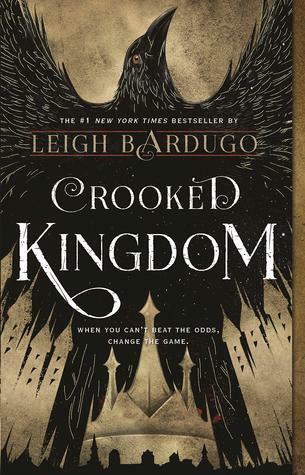 I may never forgive Leigh Bardugo for some of the things she put me through in this book. But I really did love how she dealt realistically with trauma and recovery, especially in Kaz and Inej's stories. Also, super cute queer boys, including a bisexual black boy!! And intensely adorable romantic bantering between Nina and Matthias, one of my all time favourite couples. So I guess I'm saying THIS BOOK WRECKED ME BUT ALSO BUILT ME BACK UP? 44.81% "Omg they finally kissed!!! If you've read this, I'm talking about the kiss that happens in a dank basement with guards at the door. 😘😘"
57.01% "Everything is going wrong and I am so stressed! I am worried one of the gang is gonna die. 😥"